(Winter Hours) Open to the public from 1pm to 7pm Thursday thru Monday, and 1pm to 11pm on Saturday. Private tastings are available to book online. Cab Franc & Chenin Blanc inspired by the Loire, vinified in beautiful Napa, California. "Behind the tasting bar at Gamling and McDuck hangs a modernized print of Jacques-Louis David’s “The Death of Socrates,” in which the Greek philosopher raises his pointed finger against a graffiti slathered wall. The image works as a metaphor for Gamling and McDuck itself – a label that questions some of Napa’s more humdrum-classicist tendencies and delivers a thoughtful, punk-infused brand in the heart of its urban center. 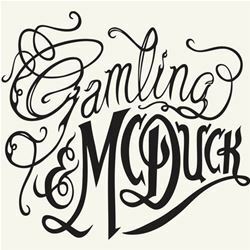 Gamling and McDuck are pseudonyms for Gabrielle Shaffer and Adam McClary, who moved to Napa in 2008 and founded their pseudo-eponymous label shortly thereafter. McClary drew a comic book detailing the history of the label, which is displayed across the tasting room walls. In one panel, Gamling and McDuck flee a heated fight between anthropomorphized monster bottles of “Napa” and “natural” wine. They prefer not to be put in a box with either camp. The wines, however, speak for themselves – a beautiful portfolio focusing on two great grapes of France’s Loire Valley: Cabernet Franc and Chenin Blanc. Shaffer and McClary source fruit from across the Golden State, from Napa to Suisun Valley to Santa Barbara. And while the tasting room may be far away from the action, Adam, who is often on hand behind the counter, can transport you to the vineyards via live-cam footage he projects on the back wall." To join the wine club, visit www.gamlingandmcduck.com or call 707-819-2835.